17 miles west of Manistique on Lake Michigan, with a wonderful view of Big Bay de Noc. Big Bay Getaway Motel has 8 units, all with two double beds, showers, satellite TV, in-room coffee, mini-fridge, cots and cribs available. A complete kitchenette is available at the end of the building with coffee, pots and pans and all the dishes you will need. There is a freezer available for your fish. All rooms have a view of Big Bay de Noc. Sandy beach and swimming area on Lake Michigan right across the road from the motel. Relax on the beach and enjoy the awesome sunset or take an early morning walk along the sandy shoreline of Lake Michigan. Big Bay Getaway Motel is on the snowmobile trails so you can ride from your door. Ride south to Fayette or head north through the Hiawatha National Forest. The forest is at the back door and side of the motel. There is plenty of parking for snowmobile and boat trailers. Good fishing and hunting all around you. Plenty of good fishing in the area - inland lakes, streams and Lake Michigan and hunting on the public lands of the Hiawatha National Forest. ATV trails are nearby in the Hiawatha National Forest. Ice fishing is also terrific, especially in Big Bay de Noc. There is plenty of sightseeing nearby including Fayette, The Three Fold Vine Winery, and The Garden Art Gallery near Garden, Seul Choix Lighthouse, Big Springs (Michigan's largest Spring), or visit Manistique for night life. Copyright 2002 by vivian wood, the webmaster for Exploring the North, Inc. All Rights Reserved. Except as permitted under the Copyright Act of 1976, as Amended, this web site may not be reproduced in whole or in part in any manner. Unless authorized by the webmaster of Exploring the North, Inc., reproduction of any picture, web page or pages on the Exploring the North website for placement on the internet is a copyright infringement. All right, title and interest in and to the material on our web pages, the web site, in whole or in part, and in and to this url and the urls contained within, is the property of the webmaster for Exploring the North, Inc. Web site created on an Apple G-4. 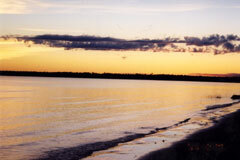 Lodging accommodations motels with view of Lake Michigan near Fayette State Park. Fishing in Big Bay de Noc and hunting in the Hiawatha National Forest.